Residents of flood-battered northern England are struggling back to work, school and homes after swollen rivers inundated roads and caused several bridges to collapse. Police said residents and business owners in the hardest-hit town, Cockermouth, would be allowed to return to their properties Monday. Some of the heaviest rainfall ever recorded in Britain triggered floods in the mountainous Lake District last week. More than 1,000 homes were flooded and people had to be rescued by helicopter when rivers burst their banks. Authorities say 18 schools remain closed, and more than two dozen roads are blocked. 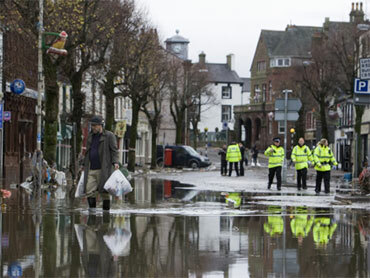 On Friday, Cumbria Police said Constable Bill Barker, 44, died as he joined rescue attempts. He was swept into the surging waters when a major bridge collapsed. Police and army experts are checking the safety of 1,800 bridges. British Prime Minister Gordon Brown praised the rescue efforts during a visit to Cumbria police's headquarters in Penrith Saturday.